What will be the outcome of tonight's match? Never in any doubt, eh? EH?! 90+4' Scotland win! 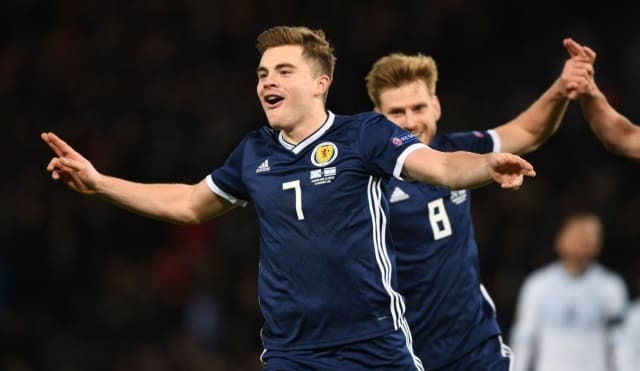 Nail-biting stuff at the end there, but an absolute masterclass from James Forrest, who scored twice before half time and again in the second half. There are no easy games following Scotland, and Zahavi's fine strike on 75 minutes ensured a nervy last 15 minutes, but credit to the Scots who held on for a much-needed victory. 90' Four additional minutes to be played at Hampden! 89' Phillips into the book for an off-the-ball clash. 88' That is a super save from Allan McGregor! The long ball over the top was flicked towards goal by Hemed and somehow, somehow the Rangers No.1 has managed to get a hand to that and Cohen can't get the rebound on target. 87' Steven Fletcher is replaced by Scott McTominay for the last few minutes. 86' Ben Harush is cautioned for a foul on Shinnie. 85' Brighton striker Tomer Hemed, currently on loan at QPR, comes on for Tawatha. 85' Tawatha with a fine cross to the back post and Robertson is there to head it out for a corner. 80' Things starting to get a bit nervy inside the national stadium, as the rain gets heavier. A draw is enough for Israel; Scotland have to win. 78' Fraser races through on goal but skies his effort. 76' A double substitution for Scotland as Christie and Armstrong make way for Phillips and Shinnie. 74' The ball finds its way to Dabbur but his effort creeps past the far post. 73' Kayal shoots from distance but it's well blocked by the Scotland defence. 72' Forrest loops in a cross from the left, it's missed by Paterson and Fletcher nods it back across goal but there are no takers. So close to a fourth! 70' Dor Peretz goes into the book for cleaning out Christie on the corner of the penalty area. Fraser stands over the ball. 68' That's five goals in 99 minutes for Forrest in a Scotland shirt. That's pretty good, isn't it? 64' James Forrest AGAIN! Match ball for the Celtic winger who has netted his third and put Scotland 3-1 up on the night. Brilliant ball in from Fraser, but Forrest still had work to do - his first touch took Ben Harush out of the equation before he slid the ball past Harush. Superb stuff and a bit of a cushion for the Scots. 57' Fraser's free kick is good but it just evades Scott McKenna's head and the Israelis clear their lines. Harush was flapping a bit but he did enough. 55' Callum McGregor lets fly from distance but it won't trouble Harush as it sails high and wide. 53' Ryan Fraser sends his corner to the edge of the six yard box and Fletcher does connect with it but his header loops onto the roof of the net. 52' Loai Taha sees yellow for a foul on Fletcher. Free kick Scotland. 46' Back under way here at a rainswept Hampden, Scotland leading 2-1, and the home side just a little bit slow to get going again. 43' JAMES FORREST AGAIN! Robertson punts it forward, Fletcher knocks it on to Christie, who takes it forward and loops it towards his Celtic team mate who finishes with aplomb. Scotland 2 Israel 1! 40' The first caution of the game comes five minutes before half time and it's Callum McGregor who is penalised for a foul on Dabbur. 38' Scotland pushing for more here. Dabbur gets a talking-to from the referee after a clash with Armstrong but there was nothing in it. 34' James Forrest gets Scotland back on terms! Stuart Armstrong's shot cannons off Tawatha, Forrest takes a touch and curls it beyond Harush. A great finish! 31' Forrest slaloms into the box but his effort is deflected behind for another corner. Harush deals with McGregor's ball in easily enough. 30' That's a good ball in from Fraser to McKenna who goes for the diving header but it's blocked. 27' The ball falls to Forrest after a great cross in from Robertson but he miscues and around 8 yards from goal. 22' Great work from Stuart Armstrong, who surges into the box where he plays in Fraser. The Bournemouth winger squares it but Fletcher can't get there and Israel clear the ball before Harush saves well from Callum McGregor's long-range effort. Better from the Scots! 19' Dor Peretz racing onto a through ball from Eli Dasa, but McKenna is over to clear the danger and wins a free kick. 14' Dabbur dances into the box and evades challenges from Callum McGregor and David Bates... he goes down but there's no chance of the referee being convinced, and it's a goal kick to Scotland. 12' Most of Israel's attacks have come down that left hand flank, almost as if they're targeting Callum Paterson in that right back position. However, that was a bad goal to lose - not to take anything away from Kayal, who couldn't have hit it any more sweetly, but questions must be asked of the Scotland defence. 9' A nightmare start for Scotland! The game has been pretty even so far but former Celtic midfielder Beram Kayal has all the time in the world to pick his spot and curl in a beautiful goal. Scotland have it all to do now. 2' An early corner for Israel but it's cleared by Scotland. 1' Referee Tobias Welz of Germany gets us under way at the national stadium! If Scotland win, who could we face in the play-off? Scotland need to win this match - both teams are on six points but in the event of a draw it would come down to head-to-head results, which is good news for Israel. In League C Group 2, Finland have secured a play-off spot after four wins out of six. In Group 3, Norway are done and dusted as group winners and in Group 4, Serbia are the favourites but the final round of fixtures will determine the winners. Ariel Harush in goal; Loai Taha in a sweeper role behind Eli Dasa, Sheran Yeini, Omri Ben Harush and Taleb Tawatha; Dor Peretz, Bibras Natcho and Beram Kayal in midfield with Eran Zahavi and Munas Dabbur up front. On the bench for the visitors: Goalkeepers Guy Haimov and Daniel Amos; Dan Glazer, Ayad Habashi, Shir Tzedek, Almog Cohen, Tomer Hemed, Ben Sahar, Dor Micha, Manor Salomon, Dia Seba and Ben Bitton. Just the one change from the team that faced Scotland in Haifa, with Loai Taha coming in for Eitan Tibi in defence. If it ain't broke, don't fix it - McLeish has gone for the same starting XI that lined up against Albania. Allan McGregor in goals, a back four of Callum Paterson, David Bates, Scott McKenna and Andy Robertson; Callum McGregor, Stuart Armstrong, Ryan Christie, Ryan Fraser, Steven Fletcher and James Forrest. On the bench for Scotland are Scott Bain and Jamie MacDonald; John Fleck, Jack Hendry, Graeme Shinnie, Gary Mackay-Steven, Scott McTominay, Matt Phillips, Oli McBurnie and Johnny Russell. What happens if Scotland win? If Scotland beat Israel, Alex McLeish's men will top the group and thus win promotion to League B. But most importantly, a win would send Scotland into the play-offs for Euro 2020. 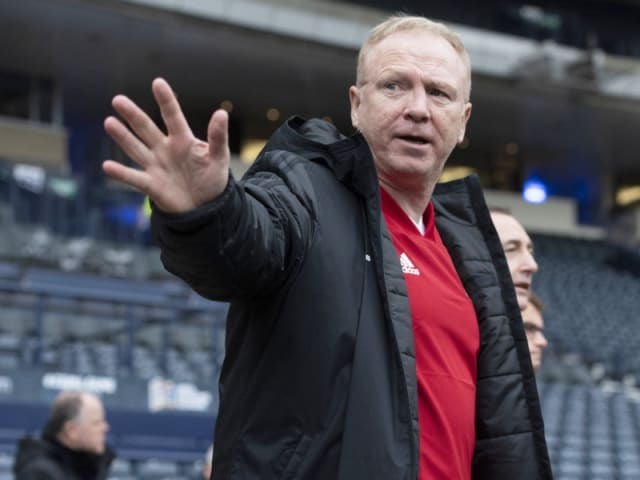 Alex McLeish has rejected the notion he stumbled across the successful team selection and formation which kept Scotland in contention to win their Nations League group and secure a guaranteed play-off spot for the Euro 2020 finals. 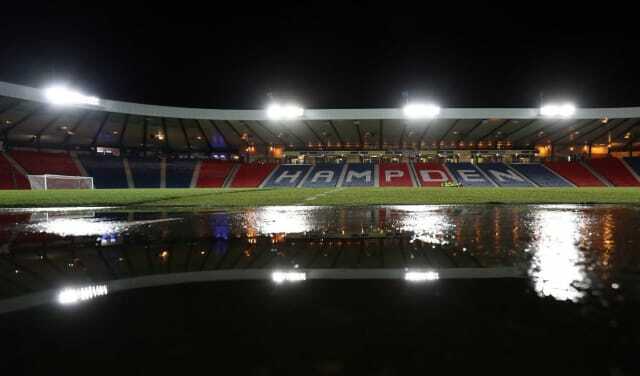 Welcome to our live blog, as Scotland take on Israel at Hampden Park this evening, looking to secure a win and thus top their UEFA Nations League Group.